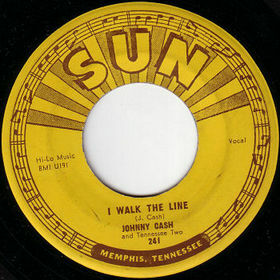 In 1956, Johnny Cash recorded the song for which this cache is named. It was the first of many number-one hits for the country singer with one of the most distinctive voices in music. He re-recorded the song four times later, and Rolling Stone magazine rated the song as #30 in its list of The 500 Greatest Songs of All Time. The song's title also serves as directions for the easiest way to get to ground zero for this cache. Depending on the direction from which you came, you should continue past the cache a short distance to take in one of the very special views of the Tri-State area. Yvxr Wbuaal Pnfu'f ibvpr, vg'f qbja-ybj.